Identification of climate as one of the most important factors controlling the geography of soils, first proposed by Dokuchaev (1948), is central to the Russian school (Volobuev, 1963; Dobrovolsky, 1967; Glazovskaya, 1981; Sokolov, 1982, 1993). Two climatic factors are particularly important: heat and moisture. Spatial variability in heat supply accounts for different energy levels of soil formation. According to the availability of moisture three major soil groups are distinguished (Figure 4.1): humid group which includes soils of tundra, forest-tundra, boreal, subboreal, and subtropical forests; arid group which includes soils of southern (or dry) steppes, semi-deserts, and deserts; and transitional between humid and arid with balanced humidity to which soils of forest-steppe and northern steppe belong (Volobuev, 1963; Sokolov, 1993). There is a close correlation between regional climates and heat and water regimes of soils. Soil moisture regimes are controlled by the humidity ratio (the ratio between annual rainfall and evapotranspiration) together with the nature of drainage and ground water level (Dimo and Rode, 1968; Rode, 1976). Thermal regimes of soils are primarily controlled by radiation budgets, which are the balance of the radiation absorbed by soils and the heat loss from soils. The thermal characteristics of soils and the accumulation and transportation of moisture in them are closely related. A combination of thermal and moisture regimes controls all processes of soil formation and weathering, such as the destruction, transformation, synthesis, and migration of organic and mineral compounds across the soil profile. In humid environments, where rainfall exceeds evaporation and free drainage exists, soil is subject to downward water movement which during the wettest periods may extend to the ground water level. A moisture permeable (washing) water regime is established in soils of this type to which the automorphic soils of boreal, subboreal, and subtropical forest biomes (podzols, podzoluvisols, cambisols, alisols, nitisols) belong (Glazovskaya, 1981; Glazovskaya and Gennadiev, 1995). Moisture regime controls the formation of humus and biochemical weathering. The washing type stimulates leaching of carbonates and the transportation of organic and organomineral compounds to the basal layers of the soils and below. In response to this process, soils with eluvial-illuvial differentiated profiles (podzols, podzoluvisols) or with clay metamorphic horizons (cambisols, alisols, nitisols) develop. The fertility of these soils is hampered by climatic factors (e.g., soil freezing in taiga) and unfavourable chemical and physical properties (low supply of nutritious elements, the presence of compacted illuvial and metamorphic horizons in the middle part of the profile, and corresponding differentiation of infiltration properties). In humid environments with poor drainage conditions, controlled by flat topography and heavy soils, moisture is retained in soils and temporary or permanent waterbearing layers develop. This moisture regime, termed 'water-stagnated', is typical of the arctic tundra (weakly gley tundra, and peaty), the typical tundra and forest-tundra biomes (gleysols), and of the northern and middle taiga (gleysols, including soddy-gley podzolized varieties) (Glazovskaya, 1981; Glazovskaya and Gennadiev, 1995). Waterlogging causes gleying of soils (i.e., translocation of iron as ferrous compounds or complexes). Products of organic matter decay and the functioning of microbiota remain in a half-decomposed state in the upper part of the soil profile. The low infiltration capacity, high density, low porosity, and weak aeration of gley horizons, as well as seasonal freezing, marginalizes agricultural use of these soils. In the arid environments, where precipitation is lower than evaporation, moisture does not penetrate the full length of the soil profile and a non-washing type of moisture regime develops. 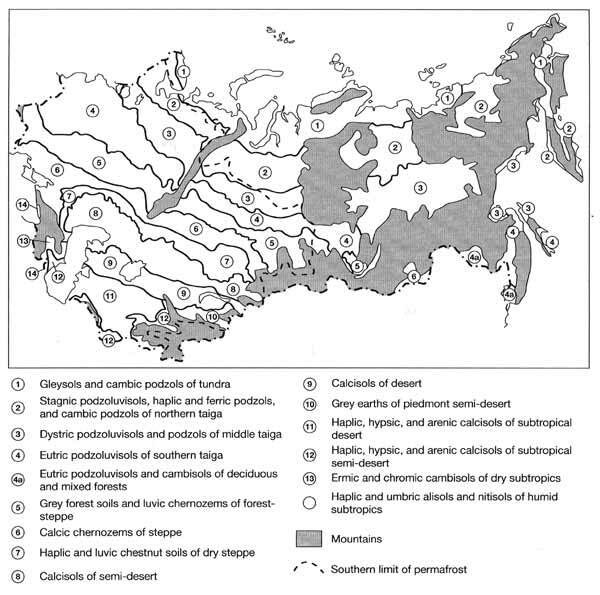 A non-washing regime is typical of most of the southern steppes (calcic chernozems, chestnut soils) and is best developed in soils of semi-deserts and deserts (calcisols, including brown semi-desert, and brown desert) (Glazovskaya 1981; Glazovskaya and Gennadiev, 1995). The lack of moisture leads to slow rates of chemical processes and therefore facilitates storage and accumulation of humus, easily soluble salts, gypsum, and carbonates in the soil profile. These features are particularly typical of brown semi-desert and desert soils. Desert and semi-desert soils are characterized by low fertility because of their moisture deficiency and their high content of gypsum and easily soluble salts. When mean annual rainfall equals mean annual evaporation, a periodical washing type of moisture regime develops where ground water is deep. It is typical of soils of the forest-steppe and northern steppe (grey forest soils, luvic, and haplic chernozems). Here, a balanced moisture regime stimulates the accumulation of humic matter, nitrogen, phosphorus, sulphur, calcium, iron, and other macro- and microelements, leaching of carbonates, formation of a granular structure typical of chernozems and eluvial-illuvial differentiation of profiles and determines the very high fertility of grey forest soils and chernozems (Volobuev, 1963; Chernozemy SSSR, 1974; Krupenikov, 1967; Sokolov, 1993; Glazovskaya and Gennadiev, 1995; Lebedeva, 1996). The course and end-result of bioclimatic soil-forming processes depend to a great extent on parent materials, while the influence of parent rocks varies between humid and arid climates (Kovda, 1946, 1947; Samoilova, 1983; Chernyakhovsky, 1991, 1994; Zamotaev and Chernyakhovsky, 1996). In humid environments, the development of a soil profile depends primarily on grain size and mineral type of rocks. In contrast, in arid environments the presence of the easily soluble salts and carbonates is more important. In humid environments, the distribution of the atmospheric moisture surplus across the soil profile depends on the infiltration properties of parent rocks. According to the prevailing infiltration properties, either of two moisture regimes develops: a stagnant regime and gleying (gleysols of tundra, forest-tundra, and taiga) or a washing regime with a broad spectrum of gleyless soils formed in the oxidation environment with a general accumulative-eluvial orientation (podzols and podzoluvisols of boreal forests) (Targulian, 1971; Dobrovolsky and Urusevskaya, 1984; Sokolov, 1993; Glazovskaya and Gennadiev, 1995). Differences in the chemical composition of parent material control the soil-forming directions. Where concentrations of the stable light-coloured feldspar-quartz component are high, podzols or sharply differentiated soils with a superficial eluvial horizon of residual silica accumulation form as, for example, in the Kola peninsula or Karelia. Weakly differentiated acid soils or cambisols develop on the weathering products of basic and intermediate rocks with the considerable alkaline-earths bases and iron as, for example, in the Far East and Caucasus. The presence of carbonates in rocks favours a permanent neutral reaction, saturation of the soil absorption complex, humus securing and long delay of podzol-forming process as exemplified by the azonal rendzic-leptosols that develop in the taiga biome. The initial rock salinity is less important in soil formation due to the intensive leaching of profiles under humid conditions. Specific azonal soils, termed andosols, are those developed on relatively easily weathered volcanic ashes and pyroclastic material of intermediate and basic composition. They occur widely in regions of active volcanism such as Kamchatka, the Kurils, and Sakhalin (Sokolov, 1973). The influence of parent material on the formation of soils is different in arid environments. The infiltration ability of rocks is not of principal importance. Soil formation (e.g., the formation of chernozems, chestnut soils, and calcisols) is predominantly of an accumulative character and chemical transformation of parent rocks, especially of laminar alumosilicate minerals, is poor and has little influence upon soil formation. The initial carbonate content of rocks is not always so important either. Profile differentiation and the variety of soil formation types are controlled by the initial salinity of the parent rocks (Kovda, 1946, 1947; Zasolennye, 1973; Pankova and Novikova, 1996). Because salinity varies slightly in comparison with the silicate contents of rocks, lithological diversity in the arid zone is lower than in humid environments. There are many more ways and mechanisms of how parent material controls the formation of soils and this short discussion does not exhaust the great variety of processes and situations. With respect to soil formation, cover deposits on watersheds are most important (Dobrovolsky, 1967, 1969). Cover loams and clays are the main soil-forming deposits in the taiga (podzoluvisols), forest-steppes (grey forest soils) and steppes (chernozems and chestnut soils). They are characterized by limited petrological diversity and typically are loams with 70-90 per cent of particles between 5 x 10-3 and 5 x 10-4 mm size, sandy loams, silts, and loams always with considerable amounts of dust fraction (Chernyakhovsky, 1991). Southern warm fades of loess (steppe zone) are calcareous, whereas northern cold or cover loess-like loams (taiga zone) usually have low or zero carbonate contents. The diversity and complicated macrostructure of soil cover in Northern Eurasia is influenced by relief, which also controls all other soil-forming factors. An almost complete spectrum of geographical zones and, therefore, soil zones, is presented on the vast plains of European territory and Western Siberia, Kazakhstan, and Central Asia. 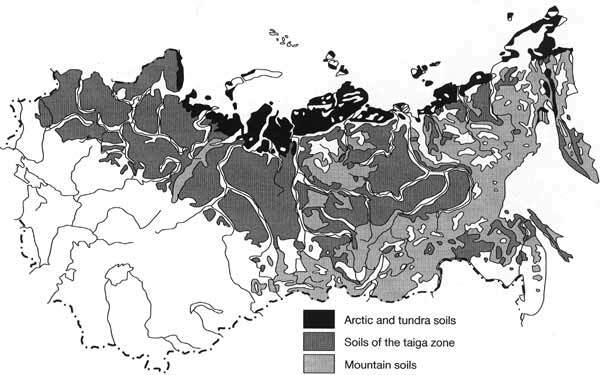 Altitudinal zonality is characteristic of the spatial organization of soil cover in the mountains of Central and Eastern Siberia, the Far East, Caucasus, and Central Asia. Meso- and microrelief control the redistribution of moisture and the migration of soluble substances and soil fines and determine the differentiation between the two principally different realms of autonomous and heteronomous soil formation. The development of autonomous or genetically independent soils is controlled by atmospheric precipitation without any additional supply of moisture and matter from other sources (Glazovskaya, 1981; Sokolov, 1993; Glazovskaya and Gennadiev, 1995). Heteronomous or genetically subordinated soils form under the influence of an additional supply of moisture and chemical compounds from other soils and ground water (Glazovskaya, 1981; Sokolov, 1993; Glazovskaya and Gennadiev, 1995). Each biome has its own type and set of soil combinations due to meso- and microlandforms which create a mosaic pattern of soil cover (Birkeland, 1984; Fridland, 1984). As a rule, differentiation in soil cover increases from humid to arid regions. The differentiation, caused by redistribution of moisture and chemical compounds by landforms, is extremely low or absent if soil and parent material have a coarse grain-size distribution and good water permeability. Moreover, the contrast between the formation of autonomous and heteronomous soils is expressed differently under the diverse hydrothermal conditions. In heteronomic environments of the arid zone, a large group of profile-forming processes, such as salinization, gleying, solodization, and siltization, exists (Elementarnye, 1992; Sokolov, 1993). These processes do not occur in the autonomous environments. This is because under heteronomous conditions a non-washing type of water regime, typical of autonomous arid soils, is replaced by stagnant or capillary regimes when uprising moisture movement prevails in proximity to saline ground water (Dimo and Rode, 1968). In the humid zone, autonomous and heteronomous soil formation are characterized by a very similar set of soil-forming processes (eluvial-illuvial and gley-metamorphic) and there are no processes which would be typical of either autonomous or heteronomous conditions. The difference between the two is in the rate or extent of the same processes. This certainly does not imply that relief is of marginal importance in humid landscapes or that rocks are of marginal importance in arid environments. Relief is the most important control over soil formation in the mountains. The genetic inequality of soil-forming factors was appreciated by Dokuchaev (1948) who defined relief as 'a creator of soil fates' in the montane environments. The diversity of shapes, steepness, and orientation of slopes control soil climates, denudation rates, and the intensive lateral geochemical migration in and under the soils. Denudation destroys products of soil formation and weathering in the upper layers and because of it slopes do not always provide for the formation of developed soils with distinctly differentiated profiles. Primitive soils, lithosols in association with bedrock outcrops and brown-coloured weakly differentiated soils, which belong a large group of cambisols, prevail. Only in foothills and on the lowest parts of slopes is the diversity of soil types greater. For example, montane podzolic soils prevail on the lower slopes of the mountains and uplands of Central Siberia, montane chestnut soils dominate in Central Asia and yellow and red earths are widespread in Transcaucasia (Glazovskaya, 1981; Zonn, 1987; Romashkevich, 1988). In Northern Eurasia, types of plant communities are closely correlated with soil formation and fertility of soils. From the geographical viewpoint there is a close match between biomes and soil zones. These spatial and genetic links are most distinctly expressed in the European part (Figure 4.1). Vegetation is the main producer and supplier of the organic soil component — humus. The amount and composition of organic fragments, their mineralization, the formation of humus, and its properties vary between geographical regions in response to spatial changes in thermal and moisture regimes and vegetation types. The largest amounts of plant remains, over 20 tonnes ha-1, are produced in moist subtropical forests in Transcaucasia. The lowest amounts, less than 2 tonnes ha-1, are characteristic of tundra and deserts (Bazilevich, 1993, 1995). In forests, the above ground biomass dominates and plant remains accumulate on the surface as litter. In steppes, tundra, and deserts, decaying organic matter is transferred directly to the soil. Humus content and its total reserve in the upper one metre horizon increase from taiga to northern steppe and then decline southwards (Table 4.2). Alongside the transformation of organic fragments and humification, mineralization of plant remains and decomposition of the already formed humus occur in soils. In tundra and taiga histosols, the mineralization of plant remains is weak and mineralization of humus substances is virtually absent. In the steppes of Moldova, Ukraine, Russia, litter supplied to soil surface is rapidly mineralized, while mineralization of humus is slow. Mineralization rates, estimated by radiocarbon dating, differ across the profile declining with depth as the activity of microorganisms becomes weaker (Chichagova and Cherkinsky, 1979, 1985; Elementarnye, 1992). In the humid forests of Transcaucasia, soils are characterized by high mineralization rates of litter and newly formed humus. With respect to the vegetation factor, it is higher plants that are usually considered. However, lower plants are also important because lower plants and microorganisms stimulate decomposition of dead bio-mass and accelerate weathering. Soils can be classified according to the prevailing groups of microorganisms (Aristovskaya, 1965; Zvyagintsev, 1987).